This post contains affiliate links so you can check out exactly what I’m talking about. My favorite box subscription on the PLANET is Stitch Fix. With three kids, I’m lucky to get dressed everyday let alone go out and buy new clothes (am I the only one with a kid who loves to escape under the changing room door?). The problem? I drag my feet on buying clothes for myself because I’m always buying clothes for my kids; but when I DO shop, I can’t find clothes that go together very well. The solution? A hand-picked box of stylish clothes picked just for me. The gorgeous turquoise box makes me squeal every time it arrives on my doorstep! Fill out a survey about the kind of clothes that you need, want, and don’t want in your box. Choose to get a box every 1-2 weeks, monthly, every other month, or try it out once. No trying to run to the store. WHAT MAKES STITCH FIX SPECIAL? It’s super low risk to try because you can send the whole box back for $20 (basically the cost of gas and a coffee if you go out to shop somewhere). If you don’t love your first box, try again. I’ve found that my stylists really start to understand me after a while and with 25% off for purchasing the whole box, I LOVE when they “get” me! I really struggle with clutter in my home, so I’m in the midst of a really awesome course about how to get rid of clutter in seven days. 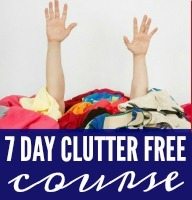 I was hesitant that this course might not be for me (I couldn’t believe that I would be able to declutter my WHOLE house in 7-days). However, the course is self paced, so you can work through each section as long or as short as you’d like. The problem? I don’t know where to start or how to stay focused when I declutter. The solution? This course that walks me through EVERY detail. See the bonus at the end too (it’s my favorite part. This course goes step by step through EVERY area of your house. Each area of the house is broken down with actionable steps about how to get rid of clutter. There are visuals for where to store the essentials. Insider tips and tricks that have worked for a busy mom of four. It’s an easy to follow along in the course so you can go at your own pace and get rid of clutter right away. BONUS: I believe that supporting each other makes this course easier to work through. SO, I have a secret Facebook group for other moms who are working through the course too. AND, I’m working through the course with you! I’ll be posting FB live so you get to see my progress! My favorite part is the home tours. Since I’m such a visual learner, I love watching the videos to what every area of the house can look like clutter free. In fact, I’ll be doing my own videos of my house so that you can see how I’m working through this course alongside you! Grab Your Spot by clicking on this link. Email me at Katie@happilyevermom.com with the title: CLUTTER FREE FOR ME! I’ll add you to a private FB group and send you $5 via paypal to buy yourself a coffee when you start the course. 🙂 OR, just keep the $5. It’s totally up to you! Note: please send me your paypal email address so that I can send you the $5 right away. Confession. 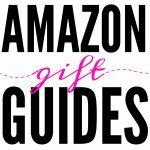 My favorite way to shop is through Amazon, well specifically Amazon prime (is it just me…?). I love the convenience of shopping on Amazon, but I also love how diverse the products are. From ebooks to sofa chairs, I can set up a reading nook in my house with just a few clicks or buy a few snacks before a big game on Sunday – all without leaving my house. *score* Because of that, we’ve cultivated a few of our favorite products into gift guides to inspire your next present (whether it’s to someone you love or just for you). 15+ Must-Haves for Breastfeeding Moms – great gifts for baby showers & New Moms. Gift Guide for Babies – Perfect for 1st birthdays or for toddlers who love books. Gift Guide for Toddlers & Preschoolers who LOVE to Play! 50 + Stocking Stuffers for Under $5 – Great gifts for friend’s birthday parties too.